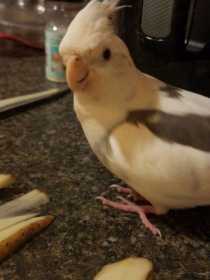 Topper is a White Faced Pied Cockatiel. For those who do not know what that is, he is white and grey. No Yellow or Orange. Topper was last seen in the Keene, Ky Area by the Macedonia Church. That was on 7/12/2018. That was the last call we heard from him.we will continue our search. Please if anyone has any information contact me immediately. We just want him home safe. He is extremely dear to our little family.